A Baroque Wedding | The New York Baroque Dance Co.
Greetings to all, this is my first blog entry and a celebratory one at that! I would like to give you the dish on Katherine and Kerry’s nuptials that occurred on Monday, August 15th, 2005. It was a beautiful, yet simple ceremony which took place on the grounds of the Belvedere Mansion in Staatsburg, New York. Katherine’s dress was absolutely beautiful. She wore an 18th century-inspired gold brocade corset with a matching skirt and a 19th century-type bustle. And her shoes! 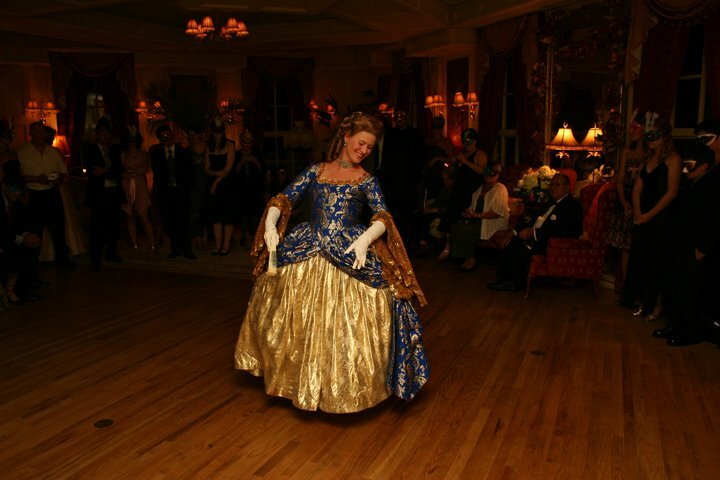 She special ordered a pair of 18th century ballroom shoes (in the same fabric as her dress) from Menkes. She topped the entire ensemble off with a white feather in her hair. The groom was quite dashing himself in his traditional Scottish kilt. My only disappointment lay in the plaid boxers he wore underneath! The mansion, which was built in the 1760’s, was the perfect setting for a couple’s first menuet as husband and wife! We chose the G minor menuetto II from Handel’s Water Music. It was just the right length and feel. Unfortunately, I was changing into my costume when Katherine and Kerry gave what I am sure was a memorable performance, and indeed, a thoughtful gift to their families and friends. Wow!, What a wonderful way to celebrate a wedding, making it both personal and Beautiful. Do you do many of these? Greetings Anonymous, This was only our second wedding event. 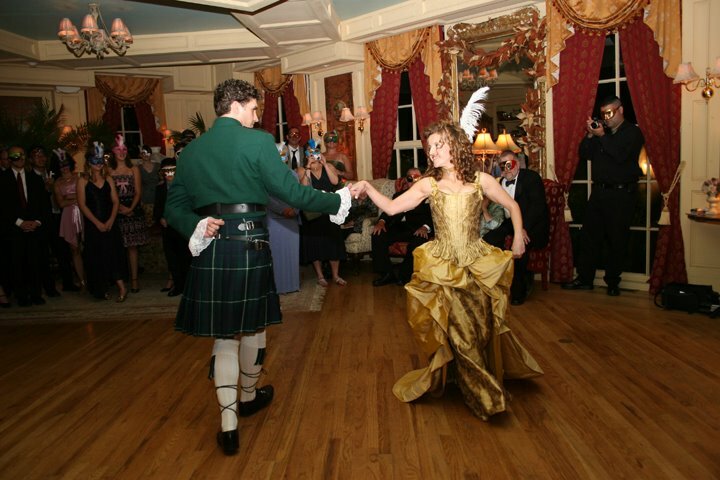 The first also included dance classes for the couple in the minuet (they chose “Greensleeves” for their music) but during the reception myself and another dancer from the company taught the guests two or three country dances throughout the evening. And as I recall no one wanted to leave the dance floor at the end of the event! That is always a sure sign of a good party…..
Dear New York Baroque Dance Company,First, we would like to apologize for the delay in posting this message. As you may imagine, life has been hectic since the wedding. We would like to thank all of you for your support in helping us have a successful wedding celebration—our dance and Caroline’s breathtaking performance were an incredible gift. We would like to give a special thank you to Caroline. She is an extraordinary teacher, dancer, person… We owe her so much! She made learning the minuet easy and quite fun! She provided us with the history of the dance, which made us appreciate it more. She even drafted a paragraph for us to include in our wedding program. Even though she was not able to watch our performance since she had to get ready, we are proud to report that we didn’t make any mistakes/miss any steps and we owe it all to her. Everyone was so impressed! Her performance was spectacular and a great surprise to all our guests. She also surprised us with a beautiful and thoughtful gift- a basket with poems and wishes. What a wonderful gesture and keepsake! We feel fortunate to have shared with Caroline our special day and to have found in her a new friend. Thank you! Katherine + Kerryp.s. We enjoyed very much your recent performance at Florence Gould Hall–Just amazing!